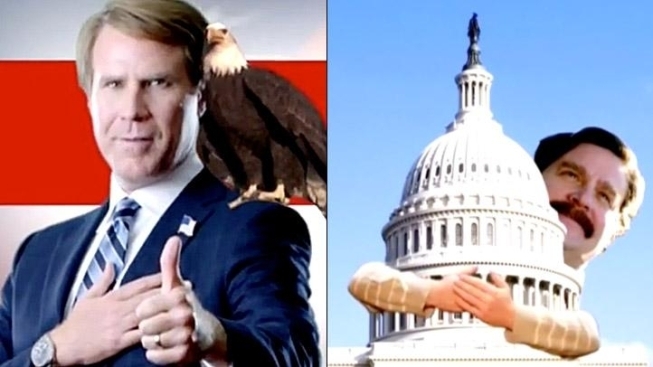 A feature-length showdown between Will Ferrell and Zach Galifianakis seems long overdue, but the drought ends this summer with "The Campaign," a political satire about the fight over one of North Carlina's seats in Congress. The first trailer--in the form of two campaign ads--has arrived, and it's kinda flat. When you consider the epic levels of jackassery that politicians from both sides of the aisle have subjected the American public to, there should be no shortage of material. But watching the "campaign" ads, we were largely unmoved--many of the funnier jokes felt awfully familiar. The film was directed by Jay Roach, who's previous forays into politics have included the HBO films "Game Change," about the McCain-Palin campaign, and "Recount," a look back at Bush v. Gore. The script is from "Eastbound and Down" alum Shawn Harwell and Chris Henchy, who wrote two other Ferrell vehicles, "The Other Guys" and "Land of the Lost." "The Campaign," co-starring Jason Sudeikis, Dylan McDermott, Brian Cox, John Lithgow and Dan Aykroyd, opens Aug. 10.